i am the weapon. everything else is accessories. The Main Event was Erin Linley (Canada - National) battling against Kimberly Tomes (USA - Lugsitnarong) for the vacant WKA North American Flyweight Muay Thai Title. This bout was fought under full Muay Thai rules using padded elbows and it turned out to be a great fight. The first round was quite close as each athlete probed and checked each others strike attempts. It was fast paced but with the express and definite intention of each girl to find out as much information as they could about the other girl. In round two, Linley started picking up the pace and pressuring Tomes to back up and/or be cornered on the ropes. Tomes still fought very well, but Linley started to establish herself both on the outside as well as in the clinch. The third round was more of the same with Linley applying pressure and Tomes responding by trying to work in the clinch. In this round Linley was to take Tomes to the canvas while in the clinch. In the final two rounds, the pressure was getting to Tomes who tried to fight back while Linley was intent on trying to finish the fight with a big KO. The knockout never came but at the end of the bout, an unanimous decision was awarded to Linley and she walked away with the Title as well. "Tomes provided great skills and a great Muay Thai experience to Linley. Thank you Kimberly! Erin's next big fight is in Bangkok in July," said coach Mike Miles. definitely in the clinch. Johnson put up a great fight, and Kellock had her work cut out for her throughout the bout. The end of the bout and its result was Kellock winning the title by unanimous decision. "Janice has very nice punches and kicks and was quite clever in the clinch," said Mike Miles. 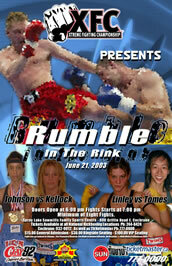 Angela Merzib (Calgary - Miles) battled against Dena Seiferling in a Kickboxing rules bout. A crowd pleasing and very entertaining bout in which the outcome was split and for Merzib. "Dena and Angela were awesome! I am a fan of both of theirs now," said Mike Miles. round, Cuff really put her combinations together and grasped victory away from Doans plans. "Great heart from Jennifer and great combinations from Jody," said Mike Miles. Carla Ramsey squared off against Megan Armstrong in a Kickboxing rules bout. Ramsey started the bout very well with good accuracy and strength in her strikes. In round two and three she slowed down while Armstrong stayed 'in the race'. The decision was split for Armstrong. Sandra Bastian lost by a very close split decision to Jessica Gladstone (132 lbs. "Sandra laid back in rounds one and two and somewhat in round three. Rounds four and five went to Sandra hands down but it was a little too late. Congratulations to Jessica," said Mike Miles.